Our fluid tanks keep a steady fluid pressure, eliminate fluid contamination and evaporation, and eliminate fluid fumes. This small tank version is 0-60 psi and supplied complete with fluid lines and fittings and is ideally suited for use with Cyanoacrylate and Anaerobic bottles up to 500g size. The bottle is placed directly inside. 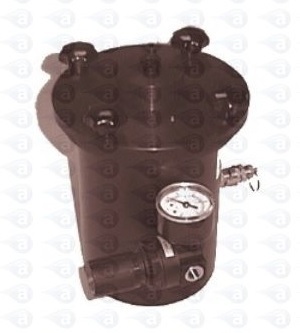 Pressure pot for use with cyanoacrylates, UV Cure, anaerobics and other low to medium viscosity fluids. Accepts adhesive bottles 250ml and 500gm or other containers placed inside the chamber or use material direct in a can or bottle. With built-in adjustable 0-60 psi regulator, luer lock tubing kit as well as a connector with dip tube for use with standard fluid lines. Easy connect to any air supply. Airtight seals ensure no leakage or air entrapment problems. The 60 psi max. operating pressure version easily handles fluid with viscosity up to 20,000 CPS. The pressure gauge and pressure regulator are located on the side for easy reading and access. Includes 1/4" OD fluid line connector kit. 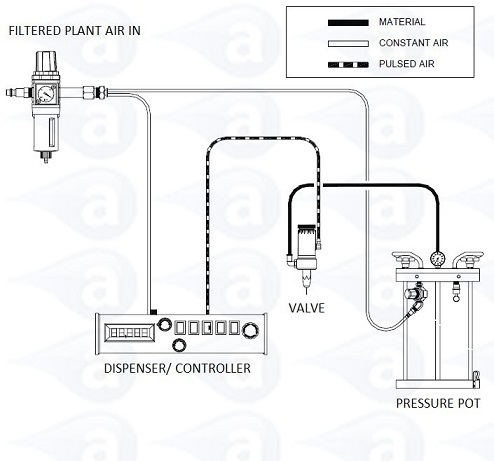 When dispensing adhesives, a container or bottle should be placed inside the tank chamber. Do not pour curable adhesives directly into the pot to avoid damage or excessive clean up. Non-cured liquids can be poured in if requred. All products are CE approved, certified industrial grade and are covered by our no-quibble One Year warranty. Also available with hand lever valves for a complete system. Summary: Standard tank unit with lid, adjustable air pressure gauge, stainless steel tube fitting, 1/4" OD flexible tube, user guide. CE approved. Summary: Spare EPR black rubber O-ring seal for the tank lid. Simple installation. Ensures a leak free operation of the tank. Tank lids seal the air using a rubber O-ring gasket. These are available as replacements direct from stock as above. Tanks will handle low to medium viscosity liquids up to 20,000 CPS. Includes thin solvents, liquid, fluxes, flowable silicones, Cyanoacrylate, UV cure, inks, paints, lubricants, threadlockers & more.